There’s no such thing as a definitive bra size. Remember that there’s no such thing as a definitive bra size.The bra size that fits the best will vary according to the style and fabric.The back of the bra should hug the narrowest part of your back and be at the same level as the front. Underwiring should curve snugly around your breasts – it should never cut into them. A test you can do is to push the wire of the bra when you have it on, if it feels soft, the wire is sitting on your breast tissue and you should try a larger cup size. If it feels hard, it is sitting on the ribcage and this is therefore fitting you correctly. To put on a bra, bend over and lower your breasts into the cups. Then stand up and fit yourself more comfortably inside it. Make sure that you move around in your new bra. Lift your arms above you head and make sure it does not ride up and is still giving you the desired effect. Always fasten a new bra on the loosest hooks. The band should still be very snug. Wear and tear and washing will relax the fit. When this happens make the band tighter. If you are unsure of the band fit, you should be able to run your finger along the inside of the band. When trying your bra on, try it on under a tight fitting top. Make sure that it gives you the line and the shape you are looking for. 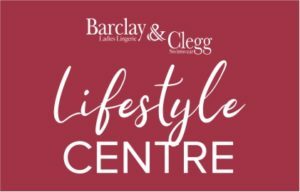 The images that Barclay & Clegg use on their website and advertising are representative of the styles available in the Barclay & Clegg stores. These styles may not always be available in the stores. This site claims no credit for any images posted, unless otherwise noted. Each image on this site is copyright to its respectful owner. If you own any used image and wish for it to be removed, please use the 'Contact Us' form with a link to the said image and it will be promptly replaced.